By Kristen Friend, staff writer – December 12, 2012. 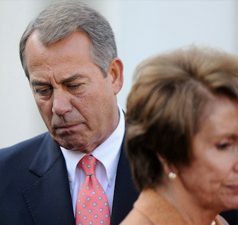 President Obama and House Speaker Boehner met privately on Sunday to discuss a deal aimed at addressing a series of expiring tax breaks and mandatory spending cuts, dubbed the “fiscal cliff,” scheduled to begin next month. Since Sunday, both parties have advanced new proposals. The President sent a new offer to the Capitol on Monday, which Republicans countered on Tuesday. On Tuesday morning, President Obama and Speaker Boehner briefly discussed the offers over the phone. Although few details have been released, officials claim the President’s latest offer asks for $1.4 trillion dollars in new tax revenue, down from his original request of $1.6 trillion, but still considerably less than Republicans say they will accept. It remains unclear whether progress is being made during the talks, leaving both politicians and pundits to speculate about what might be on the table. If rhetoric is a sign of progress, the two appear to be getting nowhere. On Tuesday, Speaker Boehner accused the White House of “slow-walking” the process forward by refusing to offer specifics on spending cuts. The Administration quickly responded by pointing to several proposals that contain clear cutbacks to government programs. It is the Republicans, says the White House, who are not providing details. Regardless of public posturing, the fact that both sides are showing discipline by not leaking any details about the offers may be a sign they are closing in on a substantive agreement. The President has been expressing his desire to reach some sort of a “grand bargain” on the budget since Republicans took the debt ceiling hostage in 2011, when similar secretive talks failed to produce an agreement. But what would such a compromise look like? Both the Obama administration and Congressional Democrats have made it clear that any workable plan must raise rates on the wealthiest taxpayers. Republicans have repeatedly responded by proposing revenue increases through the elimination of unspecified deductions and expenditures. Democrats have indicated that cuts to Social Security are off the table, while Republicans continue to insist on (also unspecified) cuts to social programs. 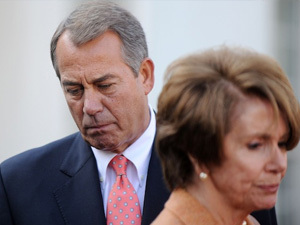 House Speaker Boehner and Democratic Leader Pelosi find little common ground. Photo: TPMLIVEWIRE. Regardless of such fears, raising the Medicare eligibility age is one of the only proposals that neither side has explicitly ruled out. It is a prize highly sought after by Republican leadership despite its deep unpopularity and seems to be a concession that President Obama could tolerate. The politics appear to be workable. The question remains, however, whether such a move is good policy. One of the primary rationales given for raising the Medicare eligibility age is that life expectancy is on the rise. People are living longer, so it makes sense to argue they do not need the program until they are older. It is true that Americans are living longer. Life expectancy has jumped to slightly over 78 years from 75 years in 1990. But these gains are not spread evenly among states or education levels. Life expectancy for Caucasian men and women at with the lowest levels of education is actually decreasing. Caucasian women without a high school diploma can expect to live 73.5 years, compared to 83.9 years for those with a college degree. Since people with a college degree are likely to make more money over a lifetime, the education gap translates to a socioeconomic gap. Those most likely to need Medicare sooner are not seeing gains in life expectancy. Raising the Medicare eligibility age would provide some savings at the federal level. However, it would also increases costs within the healthcare system as a whole. Such a rise in overall costs should be of concern if the goal is to reign in health care spending and make Medicare more solvent over the long-term. Raising the eligibility age is predicted to cost twice as much as it saves because removing 65 and 66 year olds from the Medicare program could have a ripple affect that would be felt across the health insurance market. Some seniors might choose to work longer, placing the burden of coverage onto employers. Those who retire or do not have access to employer-based health insurance would be forced to purchase insurance in the private market through state or federal exchanges that will be available in 2014. This would increase premiums for everyone participating in the exchanges as the insurance pools absorb higher risk individuals. Conversely, raising the eligibility age could cause Medicare premiums to go up for older seniors. The bulk of expensive care occurs as people get older. The relative youth and health of 65- and 66-year-olds work to bring costs down within the system. There is also the real possibility that some seniors will simply go without insurance at all. These individuals will be more likely to use expensive emergency services in lieu of regular preventative care. In theory, lower-income seniors no longer eligible for Medicare should qualify for Medicaid or federal subsidies to purchase insurance. But with some large states like Texas claiming they will not expand Medicaid coverage, a number of seniors are likely to fall through the cracks and remain uninsured. The President’s original proposal called for some additional Medicare savings, around $350 billion, much of which would be achieved by allowing Medicare to bargain for prescription drug prices. The VA and Medicaid already use their bargaining power and pay lower prices for prescription medication. Republicans, while adamant about cutting government programs, are still short on specifics. Whether the two sides can negotiate an agreement that will pass both houses of Congress by January seems dubious, but remains to be seen.